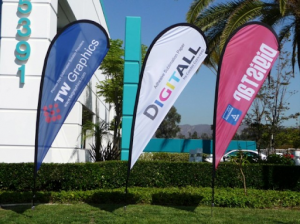 Custom advertising flags are a great way to bring in business. Since you can set them right outside your business, they’ll catch the attention of consumers already passing by. This means they might choose to stop in and have a look around because it’s convenient. But, before you can reap the benefits of having custom flags, you have to make them. The shape is the first thing you should think about. The amount of space the different flag shapes give you will influence the other elements of the flags. A rectangle flag is the same width all the way down, so you don’t have to worry about a curve or taper making part of the flag practically unusable. But, this shape is a bit plainer than a feather or teardrop flag. If you want a shape that stands out a bit more, you need to be willing to keep the other elements of the flag fairly simple so you don’t risk overcrowding it. The message you put on your flags is a vital part of the design. How else will consumers know what you’re advertising? No matter which shape of flag you choose, you should try to keep your message simple. Consumers should be able to read the entire flag at a glance. But, this is especially important if you’ve chosen a flag shape with curves. The room you can’t use for text makes the flag seem smaller, which can lead to it feeling overcrowded. Putting images on a flag can be a tricky thing. Just like with text, it’s easy to overcrowd the flag. If you have a logo, you should be able to put it on a flag without too much fuss. After all, good logos are designed to be recognizable when they’re small or at a distance. Extra care should be taken with other images. Make sure your message is short so you’ll have room for an image. And, make sure it’s something fairly simple and easy to recognize. With colors, you have a lot of freedom. If your logo should be a certain color, you should use that color for the text on the flag. If you have another image on the flag, ensure the background color is something it will stand out against. You want to choose a color scheme that contrasts well and also looks aesthetically pleasing. Custom flags are an easy way to advertise right outside your business. Creating a flag on your own instead of buying a stock one also adds a personal touch to your advertising. Posted in Flags and tagged custom advertising flags, custom flags.